Our kinetic sculpture, Struggle, represents the strife of religious, racial, and gender discrimination in the wake of India and Ireland’s partitions. Unlike a conventional sculpture, a kinetic sculpture incorporates a periodic perpetual motion. This motion is evident in Struggle as two individuals continuously raise and lower a flag while a handle is spun. One side of the flag represents Ireland while the other represents Pakistan. Three of the flag bearers are men while only one is a woman; these details convey that women too, were trying to negotiate their national identities, while also trying to overcome the marginalized roles that they were so often assigned during these tumultuous time periods. Drawing from the oppression of Catholics, gender discrimination, and a flag that is both Irish and Pakistani, the kinetic sculpture thus symbolizes partition and its effects in both India and Pakistan as well as Ireland and Northern Ireland.To illustrate the struggle to assert national identity, the sculpture depicts the forward and backward movement of the flags. The constant movement of the artwork parallels the religious discrimination (which often hampered people’s choice in national identity) that occurred in Ireland, Northern Ireland, India, and Pakistan. Additionally, the flag never fully extends or lowers, symbolizing the idea that religious discrimination was never quelled nor overcome. Urvashi Butalia, author of The Other Side of Silence: Voices from the Partition of India, agrees that partition is not overcome and that “partitions everywhere: communal tension, religious fundamentalism, continuing divisions on the basis of religion” (7). The struggle between opposing religions was further inspired by decisions Muslims and Hindus were forced to make. Muslims and Hindus were forced to choose between their home country and the country created for their religion. As emphasized by Gyanendra Pandey, author of “Can a Muslim Be an Indian?,” “Hindus or Muslims, were welcome to live in India,” only if they “gave it their undivided loyalty, and refused to look to any outside agency for help” (627). However, Muslims often had a difficult time considering India “their own nation” because, as argued throughout Pandey’s essay, Muslims were often viewed as inferior to Hindus, India’s majority religion. Pandey specifically states that “The Muslims were now the “minority,” even in districts, cities, or towns where they were a numerical majority” (610). The Muslim and Catholic struggle inspired us to represent their efforts to raise a national flag and stake a claim in asserting their national identities. This sculpture is also specifically designed to tell the tale of women who were often victimized by men during partition. Urvashi Butalia estimates that more than 75,000 women were abducted and raped by men of the same and different religious groups (105). The one woman in the sculpture, clearly outnumbered by her male counterparts, suggests that she, too, is struggling to find her place post-partition, despite the difficult odds. Our representations of gender-based violence is largely inspired by Bapsi Sidhwa’s Cracking India. Throughout the novel, Sidhwa contrasts powerful women acting as the head of the household with others forced into more servile roles subject to male authority. Lenny, the main character in the novel, is greatly inspired by her godmother, a symbol of a strong woman who is well respected by even the men in her community. Ayah, on the other hand, is brutally abducted and forced into prostitution. In fact, she feels so defeated she claims, “I’m not alive” (274). The sculpture’s inclusion of a lone powerful woman, like godmother, is essential to the idea of overcoming gender politics and serves as an element of inspiration for other women to persist in the face of difficulties. Our sculpture was inspired by a few sources, including the iconic photograph Raising the Flag on Iwo Jima (Figure 2). The photograph was taken after American marines won the Battle of Iwa Jima during World War II. Struggle was also inspired by Sisyphus’ eternal punishment of rolling a boulder up a mountain (Figure 3). Sisyphus’ constant struggle is like the subjects of our sculpture who struggle to raise their flag above the discrimination they face in asserting their national identities and staking a claim in the reconfigured nations. Sisyphus’ struggle was later embodied in a Lego kinetic sculpture found here and was our primary source of inspiration. Finally, our sculpture was influenced by a mural in Estoril Park, Ardoyne (Figure 4). 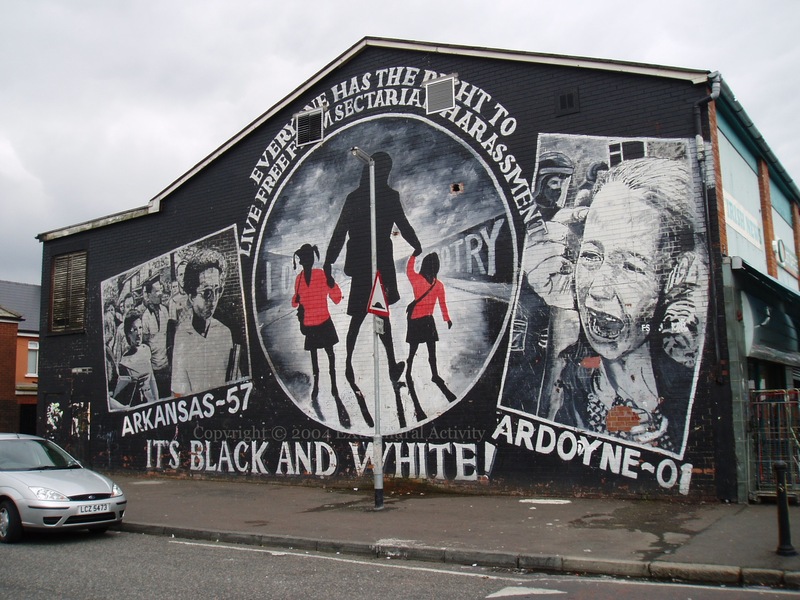 The mural connects the Holy Cross blockade, an event in which parents and children were attacked by loyalists as they walked to school, to resistance to desegregation in the United States. We were awestruck that the mural could connect events across cultural and national boundaries. Thus, our artwork aims to mimic this effort, transcending the relationship between discrimination and national identity which was faced by both Muslims and Catholics. Overall, Struggle’s kinetic structure depicts a never-ending loop, the effort to fight religious, racial, and gender discrimination as they related to national identity during partition. Although partition created a rift between people, Struggle displays the attempt to unite individuals to hoist their flags above the barriers that sought to tear their worlds apart. Butalia, Urvashi. The Other Side of Silence: Voices from the Partition of India. Durham, NC: Duke U, 2003. Print. Eastaugh, Ben. “World of Averages: Europe.” The Postnational Monitor. WordPress, 08 Apr. 2011. Web. 07 Apr. 2017. Flag Raising on Iwo Jima. 1945. General Photographic File of the Department of Navy, Iwo Jima.National Archives Catalog. Web. “It’s Black and White.” 2001. Estoril Park, Ardoyne. Extramuralactivity. Extramural Activity. Web. MacLaverty, Bernard. Oxford: W. W. Norton, 1983. Print. McKittrick, David, and David McVea. Making Sense of the Troubles. London: Penguin, 2001. Print. Pablo Carlito. “Vancouver academic deplores assaults against Muslim women amid niqab controversy.” 2015. Web. Pandey, Gyanendra. “Can a Muslim Be an Indian?” Comparative Studies in Society and History 41.4 (1999): 608-29. Print. Photius Coutsoukis. “All National Flags Listed Alphabetically”. Photius Coutsoukis, 2015. Web. Sidhwa, Bapsi. Cracking India: A Novel. Minneapolis, MN: Milkweed Ed.,2008. Print.